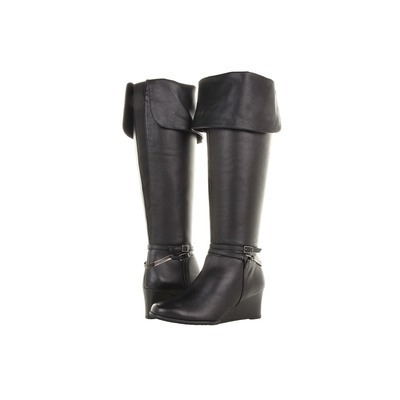 Never be understated this fall� with these Ros Hommerson� Tami-WW Calf Wedge boots. Top quality leather upper with decorative buckles at the side and a wide cuff that can be worn up or down. Elastic gore at the back allows for a bit of stretch and added comfort. Convenient side zipper allows for easy on and off. Fabric lining wicks away the moisture. Lightly padded footbed delivers support and comfort with every step for all-day wear. Please look at the calf circumference to see if you need the wide calf or the extra wide calf to purchase. British Walkers shoes were first created during 1950’s in England with Natural Crepe Sole and high quality and fashion. It was during 1970’s that Britisher’s were introduced to USA. Since then it became famous and Desired by all New Yorkers for its comfort and quality. Hip-hop stars and celebrities chose British Walker shoes for it’s fashion and its unique look. Since then these shoes acquired their own name by people such as Bwalkers, Bboys, B dubs…! Since 2012 “British Collection” by British Walkers Inc. started to recreate the same comfort, fashion and quality shoes. We brought back British Walker shoes with dual fit tech for better fit and Crepe Sole for ultimate Comfort! British Collection shoes are designed in England and hand crafted with high quality leathers overseas. British Collection are not only shoes, they are a culture for fashion! © 2019 Paradise Fashions Wide Width.com.